Before you start planning remember this is Africa and schedules don’t go according to plan on such a long trip in such a place. Its good to have a rough idea of what you want to do in each country you visit along with a rough route. However, your trip will be very stressful if you try to keep to a regimented schedule. So allocate a set amount of time to each country you will visit. You can then play around with this time as you go along. Some advice from our trip so far. Please don’t be put off by the warnings, Africa is a lovely place you just need to be on your toes as the culture is very different. The departure gate for all ro-ro traffic and the location of the offices of Catoni (the agents) are at ‘Gate C’. Driving North from the city centre on Proffessor Muamer Aksoy Cd you will pass the train depot on your left at a crossroads. Drive straight on, passing 5 central u-turns on the motorway. At the sixth u-turn take a left turn crossing the incoming traffic to drive up a small road on the right. Here it will appear you are driving in the wrong direction. On the left you will arrive at Gate C by a railway crossing. The guards don’t speak much English but ask for Catoni. You will have to leave your car outside the gate. Once your car enters the port for customs it is not allowed to leave. Selo at Catoni speaks a passable degree of English and he can help out if you run into difficulty. His phone number is 05354439827. 1- Official receipts $ 75. 2- Custom dues $ 258. 3- Insurance policy certificate $ 53. 4- Storage cost from 09/10 to 13/10 $ 250. 5- Clearing agent cost $ 285. The port of Damietta is several kilometres away from the city centre. Just north of the city is the sleepy tourist town of Ras El Bar. In Damietta protests and fights between supporters and those against the muslim brotherhood have taken place. 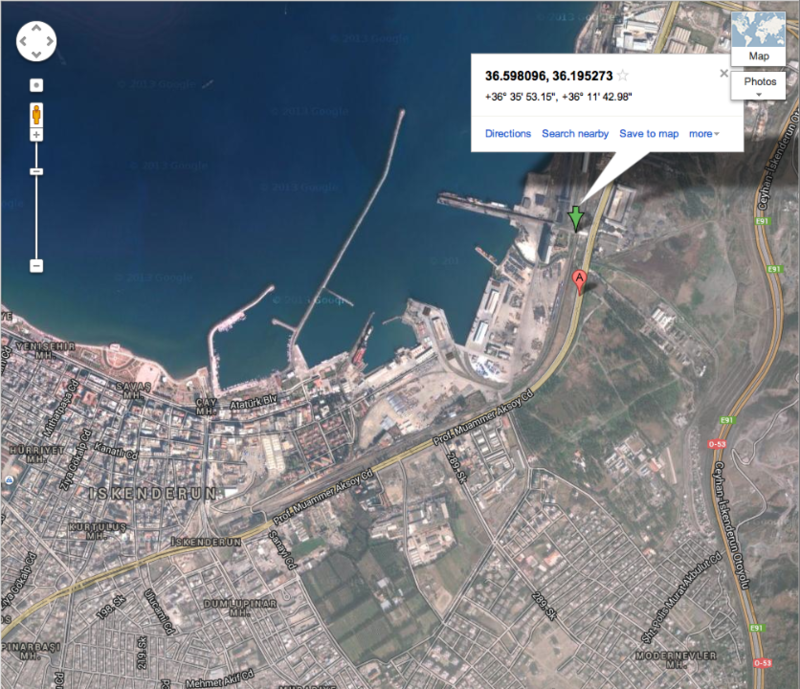 Ras El Bar is a pleasant place to wait for your vehicle to clear customs, which will take a few days as the port officials are only accustomed to dealing with truck traffic rather than Overlanders. The agents WORMS will put your vehicle in a private warehouse, which is safe and secure. Customs: ‘modern landrovers’ don’t have their chasis number imprinted directly on the chasis. This was an issue for the Egyptian customs officials who weren’t happy with the plaque on the engine block. To avoid trouble it may help to get a mechanic to put the chassis number on the chassis. If going through the centre of Cairo many of the roads are blocked with barbed wire and armoured personnel carriers, which can make navigating difficult. In addition there are a series of one way roads in Cairo that will change direction depending on the time of day. Tahrir square is completely closed off by the army to prevent its re-occupation by Muslim brotherhood supporters. As a result the national museum looks closed but it is still open you will need to walk down the side of one of the rather intimidating road blocks. In Aswan, Adam’s home is a great hang out. Although the facilities are basic, Mohammed is a great laugh and will help you sort things out. He can put you in contact with the fixer Kamal (Mob: 0100 5322669). We used Mohammed Abouda (Mob: 00201225111968). There are instructions in the welcoming book at Adam’s house on how to do things without a fixer if you want to save some money. In Aswan it is possible to get a Sudanese Visa from the Sudan embassy. It takes about two days. The embassy will be closed on a Friday. The passenger ferry leaves every Tuesday at the moment. The barge for the vehicles will leave at a different time. For the ferry, if your not getting a cabin remember to bring sleeping bag, sleeping matt, a large sheet for shade and string to hang it up with. During the day the deck is very exposed to the sun depending what time you board. Also, if your car has a fridge not connected to the solar panel it is advisable to remove anything in the fridge as temperatures inside the car and especially the fridge will get very high on the barge. Alternatively just remove all perishable goods. Chocolate will melt it will harden again in the cold, whereas meat, milk, etc will turn very nasty. And remember to drink all of your alcohol before reaching Sudan!! We used Mazar in Wadi Halfa to help us sort everything out. Funny energetic guy who took us to the Cangan hotel. About USD 7.00 per night. Its very basic but the best hotel in Wadi Halfa. It is a short walk from town. You’ll need to wait here for your vehicles to arrive. Once they arrive customs will clear them within 3 hours. They should finish the job within the same day, rather than disappearing at 5pm. There are now three routes south from Wadi Halfa. If your looking for adventure and digging yourself out of sand a lot then you can take the road to Abu Hamed. There is the old road to Dongola following the Nile. A brand new motorway of gorgeous tarmac has just been completed cutting through the desert to Dongola. Apparently the scenery is just as good as the sand-pit route and road is flawless. On this road it takes about 6 hours to reach Dongola. Apart from 50km outside of Wadi Halfa the road has been washed away in three locations by flash floods. This motorway continues on through Merowe to Atbara. The Atbara to Khartoum road has a lot of truck traffic from Port Sudan. Beware the buses that will shoot up behind you at 150 kph. There are a series of police checkpoints where they will ask you for money. We asked for receipts and pretended not to understand their requests for money. It turns out these are road tolls they are asking for but if you pretend not to understand, smile and act cheery you can get away without paying. We only paid at the last checkpoint before the Ethiopian border where the policeman gave us a receipt. People here will try to give you advice as to where to do immigration and customs. The officials will help you and it is relatively easy to find. Those giving you advice for free will expect money once you are finished. Don’t give them anything, its merely a confidence trick where they will try to make you feel guilty. Also, avoid changing money at any borders as you won’t be given a good exchange rate especially if you don’t know the exchange rate of the country your entering. There is a lot of cattle traffic on the roads. If you hit and kill cattle then you can be expected to pay over USD 1000 for the dead animal regardless of it being your fault or not. If you don’t pay then the locals can turn violent and people have been killed. A friend of ours accidentally hit and killed a donkey on his motorbike. He was immediately surrounded by a mob of locals. Fortunately he was able to escape on his motorbike before the situation got worse. There is a scam here whereby you’ll get taken by a bunch of friendly Ethiopians to a traditional Ethiopian bar for Honeyed Wine. You will be expected to pay the musicians continuous tips and at the end of the night the bar tab will be a nasty surprise. If you do go, always make sure of the price before buying it. The road up to Debark is tarmac. Thereafter road works between Debark and Axum begin. Be careful of the heavy machinery and dynamiting. You can get stuck if you hit this stretch of road at lunch time as the workmen leave their heavy machinery in the middle of the road. The last 80km up to Axum is beautiful tarmac. The road will take about 8 hours from Debark. If you’d like to do the Danakil then contact Abeba of Ethio tours. We negotiated USD 250 per person for a 4 day trip in our own vehicle. Beware the road to Erta Ale can take its toll on shocks! If you’d like to take one of their vehicles the price is USD 500 although if your a group you can try to negotiate. We used a mechanic recommended by a friend but got badly ripped off with poor service. We’d recommend going to Whim’s holland house and using their in-house mechanic. They’ll help you source spare parts and will do a good job of it!! There are a lot of armed patrols on the road these days due to the construction works. In two years a beautiful tarmac road will be finished running the length. In the meantime, sections of road are still very bad. Boggy or badly corrugated. Avoid ‘beaching’ your 4×4 in the boggy areas that have been churned up by the trucks. Google maps is very accurate at 8 and a half hours transit time. Half the road between Marsabit and Isiolo is still not in great condition. Badly corrugated and bumpy. Supposedly if you drive fast enough you can rise above the bumps, but I haven’t tried it and wouldn’t recommend it. Safe town full of British army. Makes a nice stop for Mount Kenya or the Aberdares. Be careful of a scam where a mechanic will run up to your window and tell you your car has a major problem with a wobbling wheel. They’ll spray oil on one of your shocks when your not looking. Then they’ll try to convince you to change it along with your steering column (they’ll make up some excuse for this too). Before you know it your cars been jacked up, missing a wheel and the mechanic has all the leverage. So just don’t stop regardless of what he says! Cheap accommodation on the border here fills up fast so you could be left out. We parked in a car park of a hotel and paid a nominal fee to the Askari to keep a look out for us. If you do not have a COMESA by this point the officials at the border can try to rip you off. They tried to charge us USD 350 for a 1 month pass. After two hours of negotiations we agreed USD 150 for a 3 month COMESA pass. If you buy a COMESA in advance you can probably find a better price. From what we understood the price is fully negotiable. Apparently Malawi is the cheapest place to pick up a COMESA. Watch out for the street parking. One yellow ticket covers 15 minutes and should cost 300 Ugandan shillings. You can always refuse to pay your ticket save them up, if you get clamped (which they’re not officially allowed to do) then go to the local parking office to pay your tickets where they’ll charge you the correct price for your parking. Terrific information! Very glad your trip is going well and I hope you keep the blog going. Loving the updates and the beefing up of all info as you go along, very much needed for the rest of us still at the planning stage! Just a quick question, what is a COMESA? I know it’s a free trade zone, but you mention it like it’s a visa, is it essential? Thanks Tristan, glad it’s of some help! The COMESA insurance document is a 3rd party insurance document for most countries in Africa. If your travelling around East Africa in particular you’ll need to have one. If you don’t its just another excuse for officials to extort bribes out of you.